Dermal fillers are an alternative to reduce facial wrinkles and deep fold lines with a non-surgical treatment plan. The board certified dermatologist at Baxt CosMedical® are constantly reviewing all of the dermal filler options to determine the most effective fillers to address their patients’ problems. This is why we offer a variety of dermal fillers. BELOTERO BALANCE® dermal filler is one of the facial rejuvenation fillers offered. This filler is specially designed to integrate into your skin and mold to your distinct facial contours. This filler adapts to the individuality of your skin. It softens lines and wrinkles around the nose and mouth for smooth and natural results that are “uniquely you”. 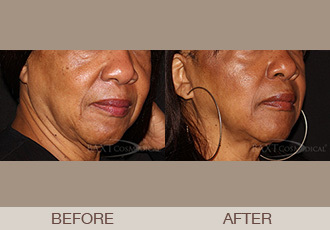 Why Should You Select BAXT CosMedical® For Your BELOTERO BALANCE® Facial Filler Injections? With the explosion of the demand for non-surgical facial rejuvenation using advanced facial fillers, many physicians and nurses are taking weekend courses on where and how to inject dermal fillers. But, should you trust your face to an injector with limited training? Would the wiser choice be to select a board certified dermatologist who has spent years of education and training specializing in the area of medicine concerned with the health and diseases of the skin and hair, nails, and mucous membranes? A dermatologist is a specialist who understands skin and facial anatomy. BELOTERO BALANCE® facial filler is a safe and effective product made of a material called hyaluronic acid or HA. HA naturally exists as a component of your skin. By binding to water, HA works to fill in facial wrinkles and folds, thereby, allowing for an immediate and smooth correction. BELOTERO BALANCE® is different than other fillers as it specifically treats moderate-to-severe etched-in lines and wrinkles such as vertical lip lines above and around the lips. BELOTERO BALANCE® is manufactured by MERZ Aesthetics® and is created using the proprietary Cohesive Polydensified Matrix (CPM) process. What Areas Of The Face Are Treated With BELOTERO BALANCE®? The versatility of BELOTERO BALANCE® makes it strong enough to handle deep treatment areas such as nasolabial folds (smile lines around the mouth), yet soft enough to treat more delicate areas such as vertical lip lines (thin lines that appear above the lip line). BELOTERO BALANCE® dermal filler has unique properties that allow it to adapt within the skin for soft and even correction. Patients immediately see results, but individual results may vary. Results may last as long as 6 months dependent on what areas of the face are injected. * In facial areas that move a lot from talking, smiling or eating may impact the duration of the filler’s effectiveness. If you are looking to reduce wrinkles and folds or thin lines around your lips, BELOTERO BALANCE® could be the answer for you. Ask Dr. Rebecca Baxt or Dr. Saida Baxt if BELOTERO BALANCE® is the right dermal filler for you.